As I sit down to write another blog I once again have the television going (this time I’m re watching the final season of Breaking Bad) and am having a nice, cold glass of beer. I should know better that to do this combination as it always gets me to reflect on past events. Luckily, I volunteered to write the blog I’m posting today so it worked out just fine. As I write this it is the day before Thanksgiving and I wasn’t able to travel home for a few days to visit with family and friends this year. This isn’t actually the first year that I’ve spent away from family and friends during the Thanksgiving holiday; there were a couple of times in college that I had decided not to return home because of school work or having to work on Thanksgiving day. However, this is the first time that I’ve genuinely not been a car ride away from returning home and it feels a bit different than previous experiences. The good thing is that the experience feeling different than previous experiences is mostly all positive. In fact only negative I can even put my finger on is not having the ability to return home if I wanted to at the moment. The fact is I have been treated very warmly by the people at St. Peter’s & St. Mary’s Episcopal Church, the Colorado Episcopal Service Corps, the 32nd Avenue Jubilee Center, St. Clare’s Ministries, and the locals in Denver in general. I will be going to Thanksgiving dinner tomorrow at Bev Thomas’ house; she is a member of St. Peter’s & St. Mary’s Episcopal Church and has been very gracious to host us tomorrow as well as a few other times in the past. However, the St. Columba house was also invited to dinner by other members of the church, a member of the Colorado Episcopal Service Corps Board of Directors, and at least one person from every other organization that I mentioned. It warmed my heart to know that we have all of these individuals in our corner to make sure that we have somewhere to go and a place to feel welcome on Thanksgiving. This is especially true considering my initial plan involved having a brunch with my housemates and then “going to watch the Cowboys lose at the closest bar.” The most surprising thing to me, however, happened last night when I was returning from my Tuesday night shift at St. Clare’s. I was walking past a man and his son who stopped me, handed me a flyer and told me that they’d love to see me at their church, Ministries Ultima Cosecha, on Thursday for a free dinner and church service; they then told me “God bless” and Happy Holidays. This type of action outside of church is always somewhat surprising to me considering I am in a rather large city, but would probably come as more of a shock to some people back home. This is because, considering who you’re asking, there is a perception that no one is friendly above the Mason-Dixon line or West of the Mississippi. This perception is, of course, shattered by almost everyone I’ve come into contact with since arriving in Colorado. All of this being said, I am very happy that I have a place to go be with friends tomorrow and watch some football. I am also extremely grateful for all of the help and hospitality from everyone involved in the Colorado Episcopal Service Corps and all of its affiliates. By the time I will post this, Thanksgiving will have come and gone and I will be in a terrible sweater singing “Jingle Bells,” drinking eggnog, and setting up Christmas decorations. However, I do hope everyone had a very Happy Thanksgiving and has a wonderful holiday season! Waking up is an interesting thing. Literally, it is a transformation of your state of consciousness after sleeping, but it is also a way of looking at a transformation in your thoughts. Being a part of ESC has made me have several wake-up moments in life, from navigating crazy food stamps offices to helping others efficiently without getting enmeshed, and lots in between. With that in mind, I’d like to share a personal wake-up playlist that was designed for literally waking up, but can also be used to jump-start waking up the mind into the destination of your choice–seeing something in a new light, getting excited about each day and its possibilities, living in the moment–whatever that may be. 2009-Medina, OH to Bloomington, IL. That list most notably, does not include Denver, which would make my moving list 6 in 6. That’s a lot of moving for a 24 year old! Friends like Kate make this moving around the country so much more enjoyable. With each move, I gain a new significant piece of my friend puzzle. Some days, it’s hard to have these pieces scattered all over the country. More days, it’s comforting to know I could jump to any region and have a soul friend near by. My fellow corps members and I talk a lot about how to provide rest for our souls in the midst of this crazy experience. Phone calls with these women are on the top of the list of those restful moments for me. Kate’s visit was possibly the most restful time I have had since I have moved here. Despite forcing my indoor-cat self out into the mountains, she brought a piece of the puzzle to me and my soul was at rest. I hope all the members of St. Columba and Centennial can have visits like this from their #everyday friends. We can all use this reminder from Martin Luther King, Jr. this week. In a world afflicted by violence and suffering, it can be easy to give into fear and hatred. We know that the way of the Cross is one of love and compassion. As Christians, we are called to love our neighbor, to choose love even when it is hard. There is a lot of truly upsetting rhetoric making the rounds right now: hatred, xenophobia, and judgment seem like they’re winning. Some lives are being given a higher value than others. We keep hearing reports of more senseless violence. In this bleak time, it seems like there is no hope. Having an open heart can feel like a risk that’s too big to take, but that is precisely what Jesus asks us to do. We are called to love every one of God’s children, without exception, and the fact is, Dr King is right- that’s the only thing that works. I sit here on a beautiful November evening with a bowl of macaroni and cheese, a cold glass of beer and Return of the Jedi playing on our television; it seems as though I’m getting back in touch with my college-self as I reflect on several things bouncing back and forth between my head. The first thing I’m thinking about while watching Star Wars is how ecstatic I am about The Force Awakens coming out in December; as a life-long fan I can’t wait to get my Jedi on next month. I am also reflecting on the past few days when we had the pleasure of hosting Brittany and Harlowe from Centennial House in Steamboat Springs. It is always enjoyable to get to catch up with Steamboat to see how they’re doing and how they’re progressing in their job sites. The weekend was filled with a scavenger hunt around Denver, getting to try Vegan food (which to my surprise was delicious), and being hosted by Tory and her wife for a delicious dinner on Friday; participating in a resume workshop and assisting/dining at a fundraiser held by St. Clare’s Ministry on Saturday; and finally attending church and having brunch with the ESC board on Sunday. We also got the opportunity to take the girls from Steamboat to a local bar called Punch Bowl Social on Saturday night; it was quite a delightful weekend. Above all else though, the part of the weekend that stood out most to me was the Enneagram tests we all took to determine where our personality was on a scale of one through nine. We had one one (the perfectionist), one three (the achiever), two fives (the observer), three sevens (the adventurer), one eight (the asserter), and two nines (the peacemaker). I ended up being the one four (the romantic) which didn’t come as much of a surprise to me after briefly reading over the material in our books. With the label of the four comes a lot that can be deemed as being positive and qualities that I recognize possessing. These include creativity, passion, empathy, and being introspective. Then there were, of course, qualities that could be deemed as being negative such as being self-absorbed, needy, dramatic, and not in touch with reality. Some of the more negative qualities were disheartening to read because I’ve definitely been all of these in some form, although much more in my teenage years than anytime in recent memory. However, I still found myself being caught up in some of the ways I’ve been prone to acting in the past and how I must have come off to others around me. I especially got caught up in a passage from a book that talked about the four’s “fantasy self” which I have definitely found myself in when I have been more in touch with my introverted side. It said that an introverted four will become focused on perceived talents and imagine their end results rather than cultivating these talents which will “invite ridicule and rejection;” rough stuff. I have also come to realize over the years that much of my artistic side seems to rely on my feelings of melancholy and a part of me even enjoys feeling that way so that I can be inspired to work on things. I even neglected to write the rest of this blog for two days until I had an argument with someone very dear to me and decided to direct my energy back towards this. Although I’m much more of an extrovert than I ever was as a child I still find myself obsessing over different feelings at different times. It’s why I’ve always loved watching movies and television, listening to music, and writing in order to tap into feelings of joy, sadness, anger, fear and love among other emotions. It’s why I was always more interested in using my imagination as a kid rather than learning how something operates and how I can use that to get ahead. It’s why when I’d play Star Wars as a kid I’d always assume the role of Darth Vader; because something in me even as a child wanted to feel a sense of power, rejection, eventually falling and then getting redemption. I am still coming around to the idea of letting myself have a learning curve when it comes to learning and working on myself in both my personal and spiritual life. I do, after all have a little affinity for the dramatic; but I am working hard everyday at figuring how to use my strengths in order to discover my place in life as well as working hard on becoming the type of person I want to be. So as much as I might want this fact to be recognized, I have to learn to be content with the fact that I know this and it will one day be beneficial for me. I hope that everyone finds grace when reviewing themselves and remembers that God knows how imperfect we all can be and has patience with all of us. I also hope that everyone has a very happy Thanksgiving and may the force be with you. 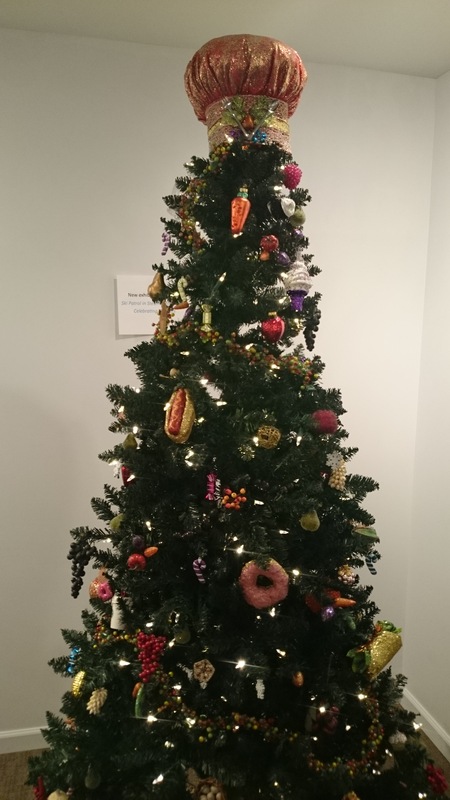 “It’s beginning to look a lot like…” NO, TOO SOON!! Oh, the holidays! The end of the year brings beautiful lights, snow, sing-a-longs and lots and lots of comfort food! If you didn’t already know this about me, I am a bit of a foodee. I absolutely love good food. I think that cooking might be one of my love languages. (I’m not sure that’s actually a love language, but I do love to make sure that those I care about are well fed.) That being the case, I’ve decided to continue the trend of including a recipe. Delicious!! A lot has change in the past month, I am facing some unexpected issues that require me to make some pretty dramatic dietary changes. 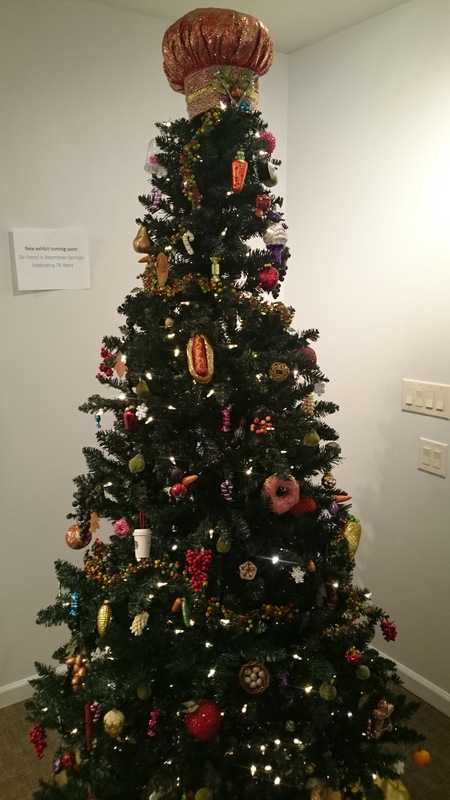 Now comes the challenge of trying to make healthy choices during the season of cakes and sugarplums. But how on earth does one navigate the holidays while trying to avoid things like wheat and dairy? (That’s a real question, I actually have no idea! I’ll get back to you once I figure it out.) I will likely give myself a bit of a pass on Thanksgiving and Christmas, but what on earth am I going to eat every other day of the year? Probably ice cream. Or, nice cream, really. Now, I realize that a person can’t live off of nothing but frozen treats, but a girl can try, right?? I’m kidding of course, now more than ever I’m trying ensure that my meals are nutrient rich and balanced, but who said that balance means blasé? I used to be somewhat convinced that nutrient rich whole foods were also wholly lacking flavor, (or full of flavors that I wanted to keep as far away from my mouth as possible.) God is giving me a lesson in my own ignorance, as new worlds of flavor are opening up for me daily! 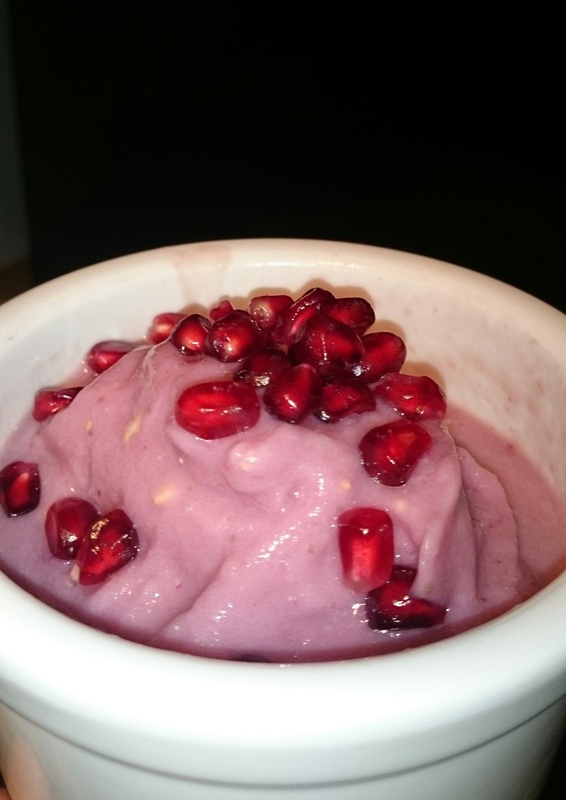 So, friends, I present to you my most recent indulgence: Banana Pomegranate nice cream! Thank you for all of your continued support. I will share more details in the coming weeks, but for now please keep me in your thoughts and prayers as I move through unfamiliar territory. I have an MRI tomorrow to make sure that I am not growing an alien, and once I know for sure what’s happening I’ll have more to report. This post is from Harlowe, of the Centennial House. Colorado living and the start of winter has me on cloud 9. There’s a foot of snow on the ground here, and perhaps coming from California has me all naive and I’ll hate it by February, but right now I love it. I was able to snowboard at Arapahoe Basin with a college friend of mine last Saturday, and I’ve already started planning the next ski day. I can’t help singing “Living in a Winter Wonderland” on my way to work through the ice and snow, and took half an hour to run around like a child in this fun white stuff after work today. I’ve come to feel nicely settled into my job at Yampatika (nothing beats teaching about the environment in such a beautiful setting) and into my home life at the Centennial House. In short, “life is good”. While the general ease and happiness I feel is fantastic, it’s not all that surprising, since I have long been a super-optimist. To the point of straight-up ignoring any potential problems so much so that I literally believe they don’t exist. This super-optimistic tendency dawned on me during our Centennial House formation time with Catie this week. We were exploring how we, as individuals, react to and deal with conflict, and how that will cause potential conflict to play out in community. A short quiz and some explanations helped us determine where we fall on a scale of conflict strategies; from forcing your way, through collaborating, compromising, and accommodating, to altogether avoiding it. I had never thought of optimism as tied with avoiding problems, but for me I think it is. Perhaps it is partly the Californian “chill” ideal, or maybe I’ve subconsciously overinflated the benefits of optimism. I vividly remember that as a child, I’d just sit there smiling for no reason because someone told me that physically having a smile on your face and force your brain through the placebo effect to be happier. I realized for the first time during our discussion of conflict styles that the “be happy” and “no drama” attitudes I’ve always prided myself on might not always be the best. While I can’t readily call to mind times that it has been detrimental, I would not be surprised if some past conflicts were escalated due to my letting them fester. This is not to say my go-to conflict strategy of “avoiding” is entirely negative, either. I said during the formation discussion that oftentimes a conflict does bubble over and dealing with it later (after a period of avoiding) turns out to be the best route. Another realization that dawned on me during formation was that all people process conflict and problems differently. I’ve often encountered friends in conflict and reacted with a “why do you care so much?” or a “it’s really not that bad, just think about the positives instead.” I need to keep conscious of the fact that for some people, it is better and even healthier to grapple with issues as they arise rather than ignore them till they go away. I suppose this is one more scenario that shows the need for non-judgemental compassion and acceptance of differing behaviours. Since the conflict activity, I’ve been thinking about it and trying to pinpoint any conflicts that I may currently be avoiding. Nothing huge is jumping out to me, so either life really is good or I’m just so practiced at avoiding conflict that I can’t see it. I plan to take this feeling in which I feel pretty settled and content to explore the self-discovery that came about in our formation time. This weekend we will travel to Denver to join the St. Columba House in an exploration of our Enneagram types. A pre-quiz diagnosed me as a 9/peacemaker, which certainly goes along with my tendency to avoid conflict. I am excited to delve deeper into a self-examination and for the opportunity to share it with the rest of the Service Corps members. Ever the optimist, I have high hopes for what looks to be a fantastic weekend in the “big” city! 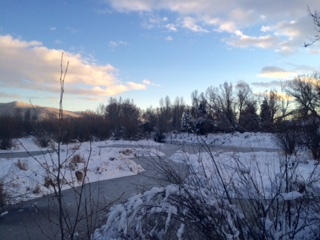 Snowy Yampa: Steamboat’s Yampa River, partly frozen in November! This is where I got to play in the snow on my way home from work, seriously a winter wonderland. 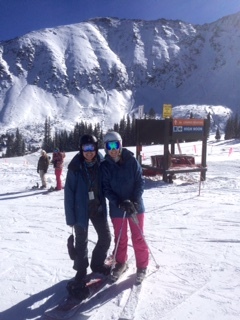 Skiing at A-Basin: I met up with my college friend Amanda for some great early season shredding! 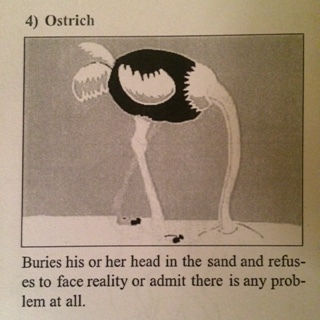 The Avoiding Ostrich: Apparently, this is me.